Committed to Deliver…. 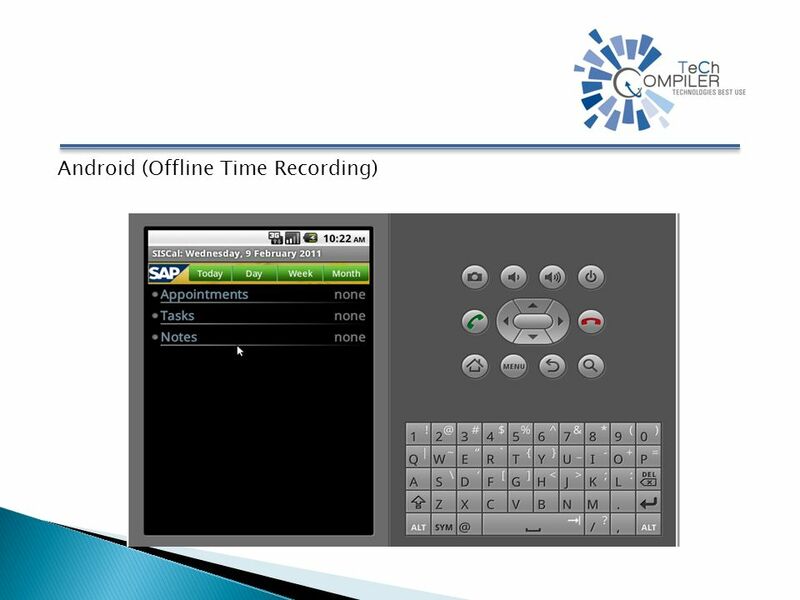 Android OTR(Offline Time Recording) is Calendar application based on Google Android operating system. It was developed based on. 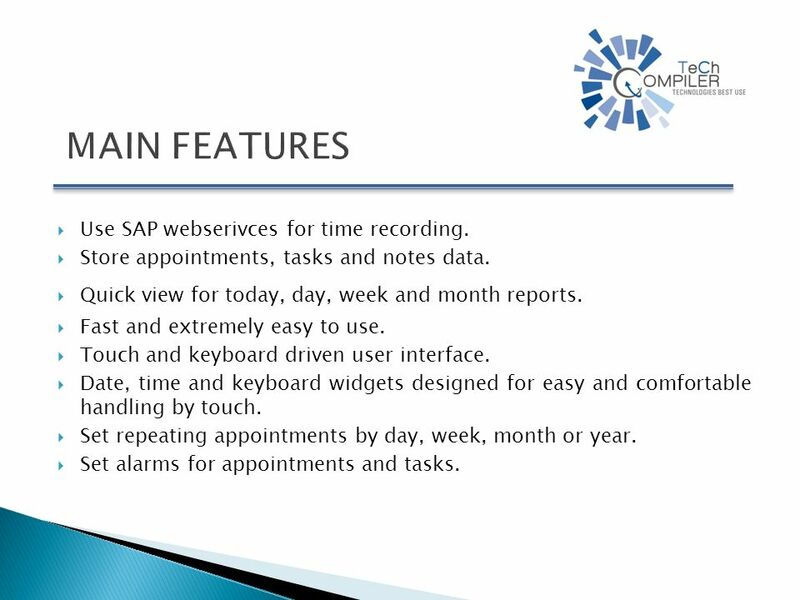 3 Use SAP webserivces for time recording. Store appointments, tasks and notes data. Quick view for today, day, week and month reports. Fast and extremely easy to use. Touch and keyboard driven user interface. Date, time and keyboard widgets designed for easy and comfortable handling by touch. Set repeating appointments by day, week, month or year. Set alarms for appointments and tasks. 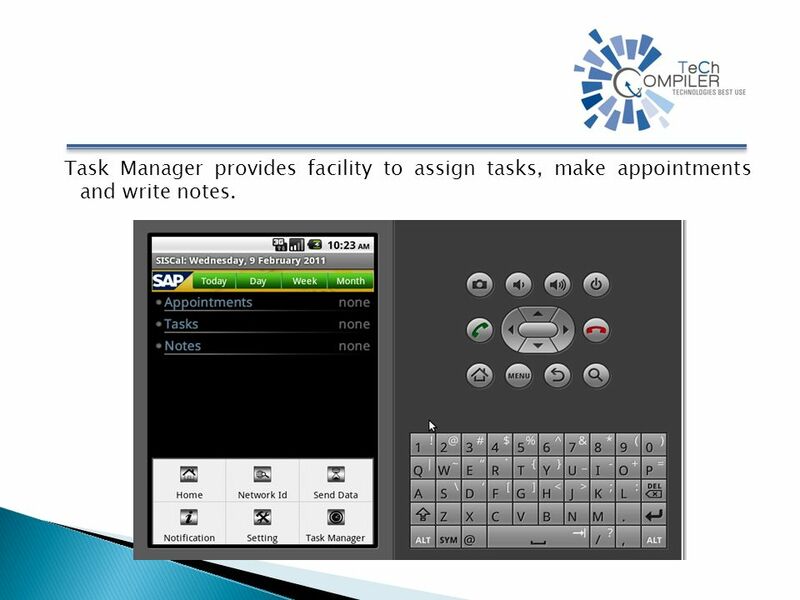 5 Task Manager provides facility to assign tasks, make appointments and write notes. 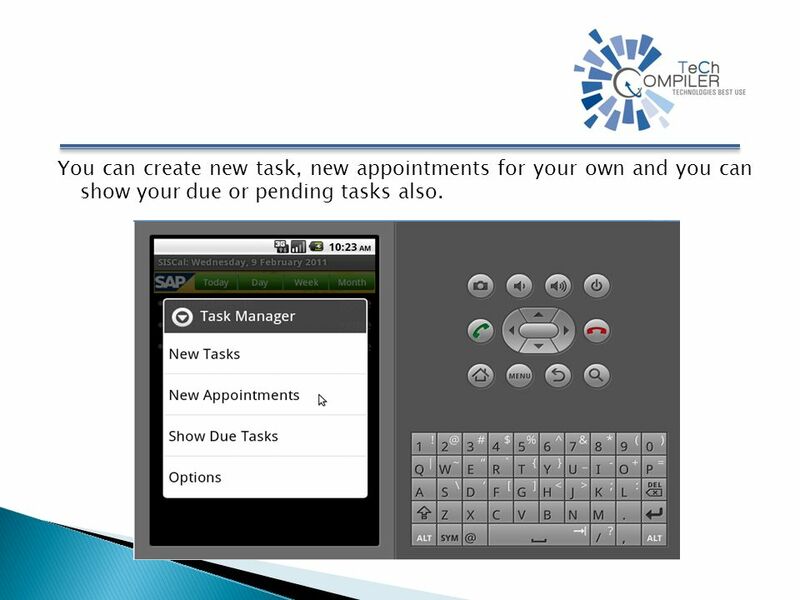 6 You can create new task, new appointments for your own and you can show your due or pending tasks also. 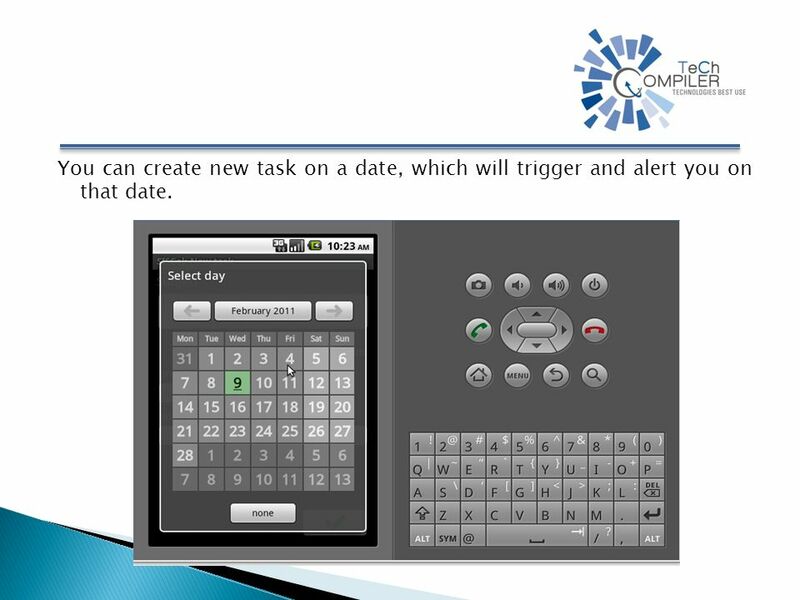 7 You can create new task on a date, which will trigger and alert you on that date. 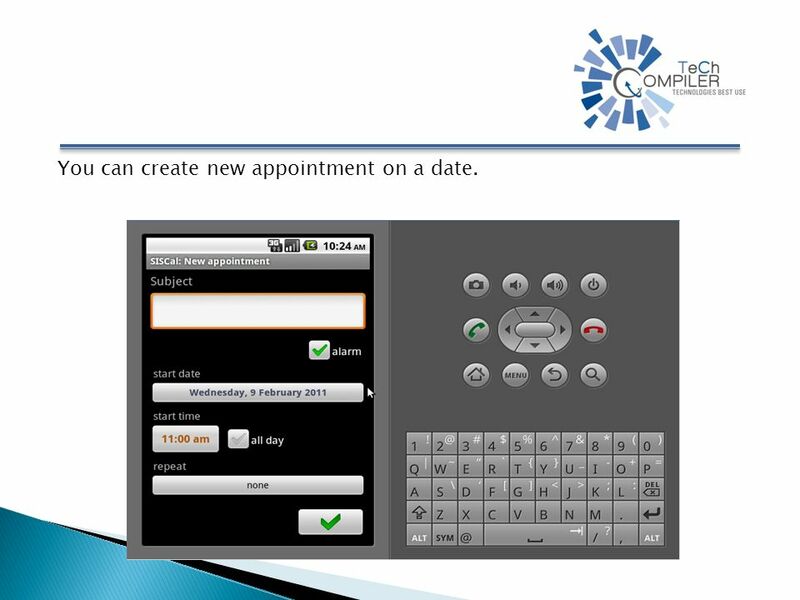 8 You can create new appointment on a date. 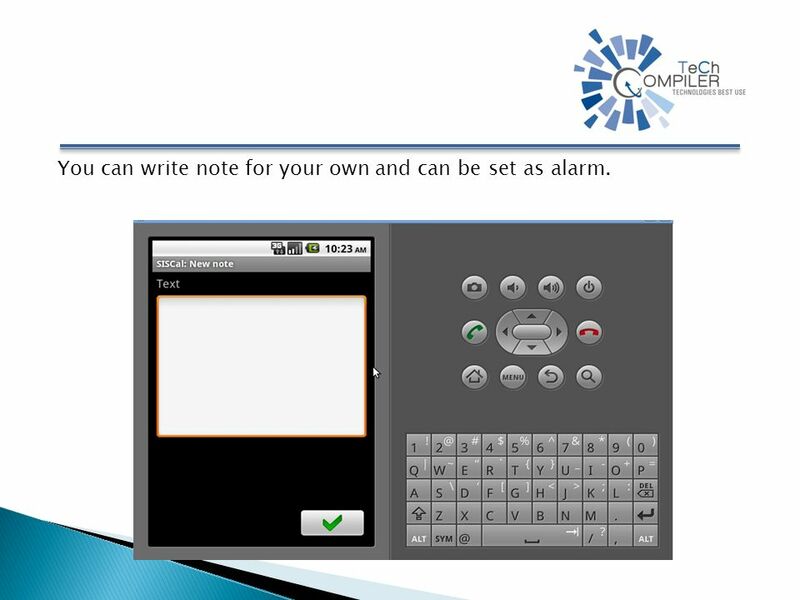 9 You can write note for your own and can be set as alarm. 10 Your tasks, appointments and notes will be shown on different colour in a column. 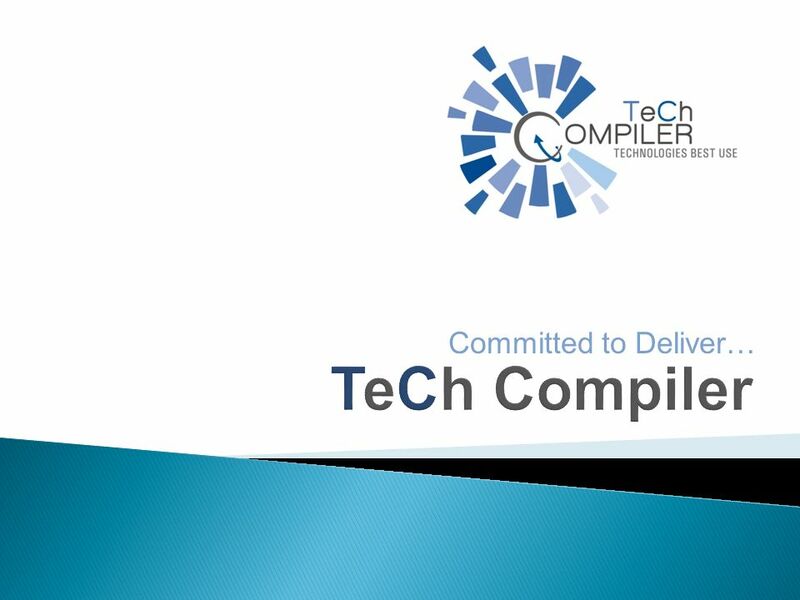 Download ppt "Committed to Deliver…. 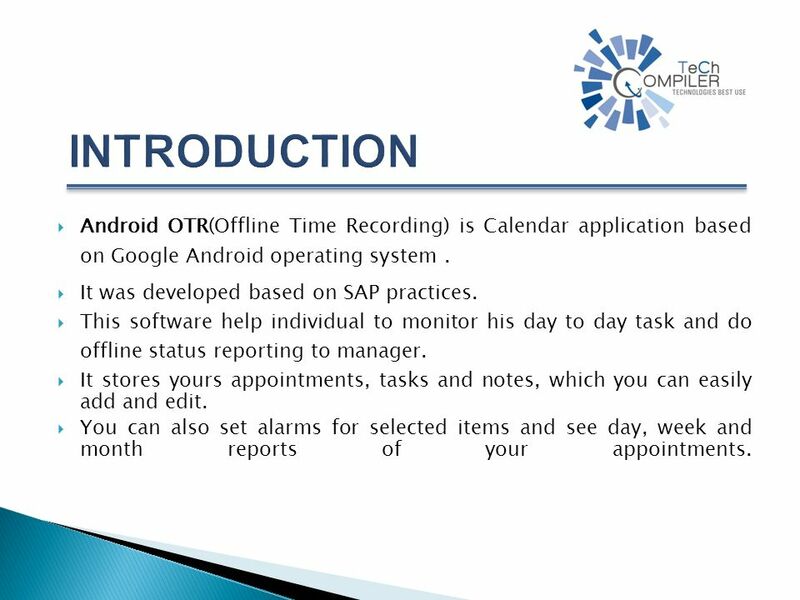 Android OTR(Offline Time Recording) is Calendar application based on Google Android operating system. It was developed based on." SlottaTime is a computer program specifically designed to meet the needs of the Service Industry... What is SlottaTime? Login This is the Inaugural screen of the software. The software is password protected and It prevents unauthorized access to your data. Overview SalesSmart presenting Steve Costa Successful By Design CEO. SalesPad SalesPad delivers an all-in-one order entry, inventory and sales management solution integrate seamlessly with Dynamics GP SalesPad simplifies. Artwork Production Workflow And Approval Management For Ad Agency Networks And Design Agencies Future ready online application with user friendly features. CHAPTER © 2011 The McGraw-Hill Companies, Inc. All rights reserved. 11 Scheduling. 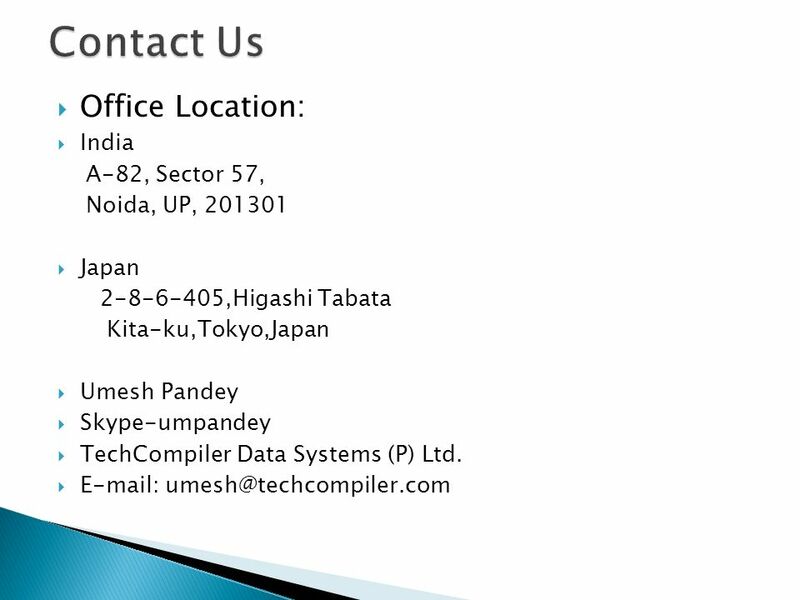 Customer Relationship and Contact Management Software Demonstration: Contact Management Process. 2010 Practice Management Annual Conference PCLaw® Office Efficiency Tools – Calendaring, Phone Call & Document Management Presented by: Deborah Schaefer. Pasewark & Pasewark 1 Outlook Lesson 3 Working with Other Outlook Tools Microsoft Office 2007: Introductory. Outlook Lesson 6 Managing Calendars and Tasks Microsoft Office 2010 Advanced Cable / Morrison 1. Committed to Deliver…. 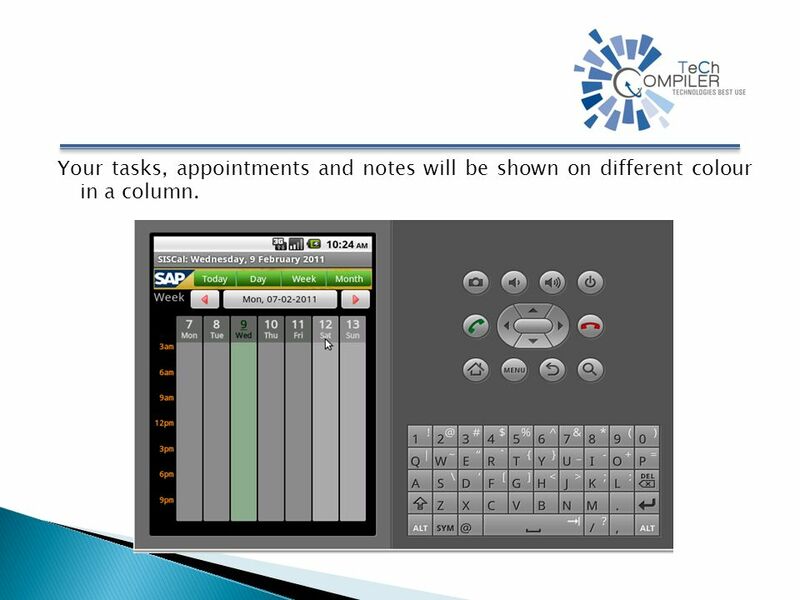  Android OTR(Offline Time Recording) is Calendar application based on Google Android operating system.  It was developed based. Chapter 3 Automating Business Processes with Workflow. CIS—100 Chapter 13--Outlook 1. Using Your Mail to Take Action 2 Outlooks allows you to take several actions to organize, categorize, and respond to your. Introduction to Skype A. Name -. Applies to Skype for home and small business accounts. Advanced User Guide to Outlook and all its features. Introduction to Microsoft Outlook 2007 For existing users who are upgrading to Outlook 2007 David Wicks | Assistant Professor | Director of Instructional. Connecting Businesses and Staff Tools for the Virtual Office  Microsoft Groove Office Collaboration Software  Skype VOIP Telephone  Transferring Files.